netTALK Connect was launched in late 2015 by netTALK. netTALK was founded in 2008 and is a publicly traded company that offers VoIP services for landlines and those that want to use its mobile app. netTALK uses its netTALK Connect brand to resell T-Mobile business plans with no credit checks. Consequently, the service is aimed at those who need a mobile line for their business. If you are currently a T-Mobile customer that wants to switch over to netTALK you will likely first need to temporarily port out to another carrier first. 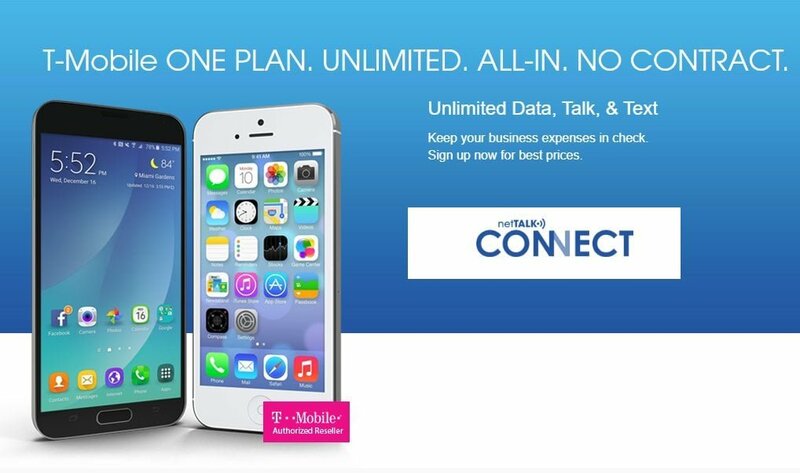 This is because technically netTALK is not considered an MVNO but a T-Mobile business plan reseller. netTALK does not really sell its own phone plans, it only resells T-Mobile plans. Since your number is already with T-Mobile there is nothing to port. MVNO’s on the other hand are not reselling T-Mobile plans, they have their own customized plans and so numbers can be ported from T-Mobile to a T-Mobile MVNO. netTALK Connect wireless plans and SIM cards are only available directly through the netTALK Connect Wireless website. Only bring your own device is supported. Any out of contract T-Mobile postpaid compatible device will work. Unlocked AT&T compatible phones will also work. Most universally unlocked phones from manufacturer’s such as Motorola and Samsung are also compatible. Customer support is available by e-mail at [email protected] or [email protected]. netTALK Wireless does not specify it’s customer support hours other than to say they are limited to standard working office hours.